Greetings everyone. We recently made our way back from a week in Las Vegas which means the sleep counter for the month of November took a serious decrement. Not complaining, of course, seeing as how that was pretty much self-inflicted. From a birder’s perspective, Vegas is up there in the top 10 birding places we’ve ever had the pleasure of visiting. Actually, should clarify that a bit, the birding is primarily a combination of the Henderson Bird Viewing Preserve and the Red Rock Canyon National Conservation Area inside the Mojave Desert. We opted to rent some glass out there this time rather than hauling out the Beast. I wanted the prime Nikon 600 f/4 but the VR ended up being broken on that option, so settled for the 150-600 f5-6.3 Tamron. I am here to say, Tamaron glass is NOT Nikon glass. Still need to go through the images, but it was a fight the entire time. That glass is way to light to hand hold in the wind and extremely slow to focus compared to my rig making it impossible to nail any in-flight shots. Did manage to get at least one +1 and possibly a couple more. More to come on that front. For now, was totally shocked when I came upon this set of pictures in the queue. 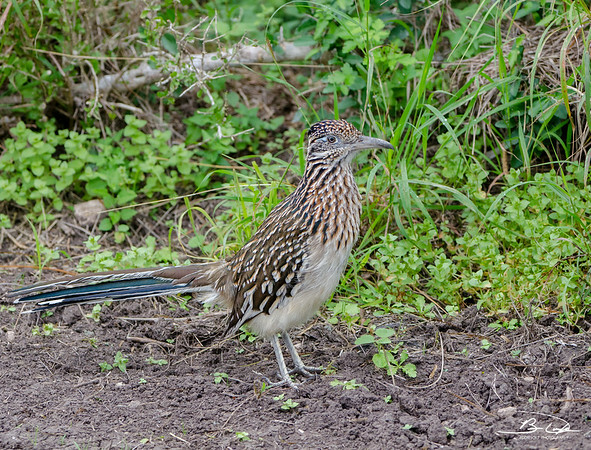 This is not the first time the Greater Roadrunner has appeared here at Intrigued, first appearing way back in May of 2013 (link here). That first encounter was at the Henderson Bird Viewing Preserve and took some effort to find. It also didn’t allow us to get too close it. Now this specimen was the Walmart greeter for Laguna Atascosa.National Wildlife Refuge. We were navigating the absolutely awful road (if you can call it that) that leads into that refuge when our little feathered friend popped out of the brushline. Hit the jump to read more about my favorite runner. This immediately provoked our action word (it’s a secret) causing Linda to slam on the brakes and bring the car to a skidding stop. Out pops the camera and the shutter went snapping. You would think with the abrupt stop and having large glass directed at it the Runner would have opted to head back into the safety of the brush. Nope, apparently it was glamour shot day – it just hung out there doing Zoolander poses. It did blend well with the background, but there wasn’t much I could do about that. I was definitely able to get better detail than the previous set. You can see the blue hues in the feathering and around the head. This one is lacking the red highlight which indicates it is in breeding plumage. I did go to Cornell’s birding site (link here) and confirmed there is no distinction between adult males and females. By the way, if you head over to their site, check out the last reference shot in the photo strip – what is up with that last picture – did someone try to remove something in the background or what? The shot above shows their crown raised. This one was content on keeping it lowered for most of the time I was shooting. It looked over and saw me.. well, probably its own reflection in the glass and raised the crest momentarily before combing it back to resume the hunt for lizards. Just realized I have zero pictures of this bird in flight. Not too surprising since they tend to spend all their time on the ground foraging for insects and other small creatures. Getting a flight shot will have to go on my goal list for future encounters. Coming to the end of the shots in this series, so better get to some facts stat. 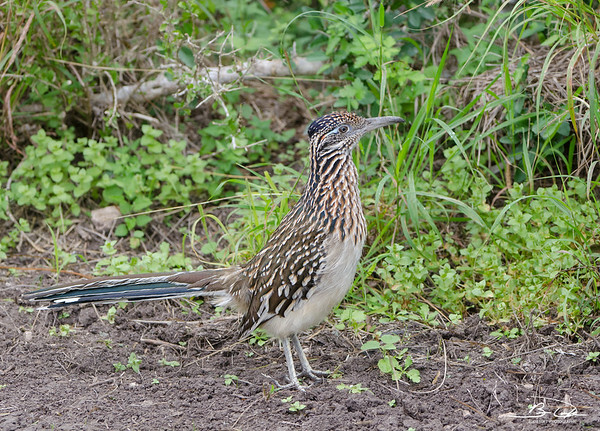 Who knew that our childhood cartoon was a lie – the Roadrunner doesn’t always defeat the Coyote. Apparently the +40mph speed of the Coyote is about twice the speed of an average RoadRunner. That still puts this bird well beyond my land speed. They have a clever salt secretion mechanism consisting of a gland in front of their eyes allowing them to conserve water. I was not aware they have the ability to eat venomous lizards and scorpions – wonder if scientists have studied ways to harness that trait for our safety. They will pair up to take on rattlesnakes with one taking the role as rodeo clown while the other sneaks up and “pins its head, then bashes the snake against a rock” – now that is an image. If it is unable to digest the entire snake at once, it will simply walk around with the remaining portion hanging out its bill. I personally think this is just showing off and warning other snakes their fate should they choose to disrespect its authority. They also have an “X” footprint which hides which direction it is heading (so evil spirits are unable to follow). There was actually another reason for featuring this bird today. 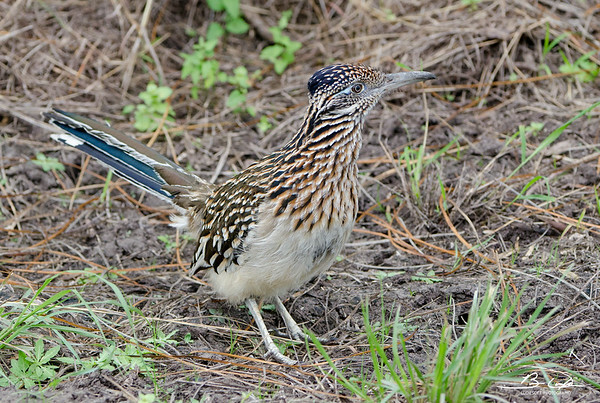 Along with the Wolf, the RoadRunner is my totem animal. Obviously I am into birding, but this feathered species is also associated with my favorite sporting activity. It has historically been revered for their courage, strength, speed, and endurance. 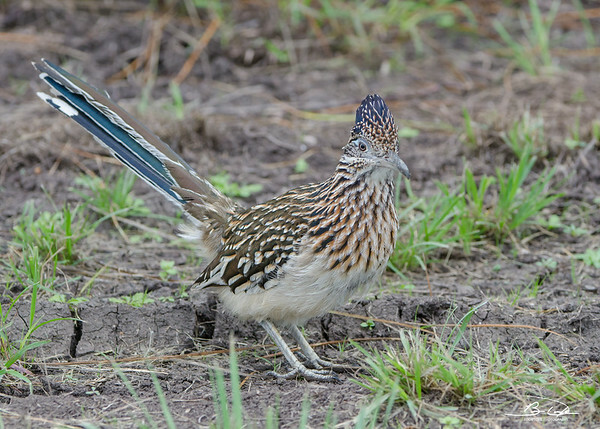 Thanks to our recent trip to Vegas, I will forever be linked to the Greater Roadrunner. These are one of the strangest birds. When I saw one for the first time I laughed at how fast and strangely they ran. I have seen them with a snake in their bill. I’m jealous – would love to have the shot of one gorging on a snake – probably cause a divorce if I tried to hang it on the wall (even dead snakes are the root of all evil for Linda – you think she would worship the RoadRunner …and the Mongoose. Appreciate you dropping in – my posts feel a bit boring now compared to kayak rescue training on the open sea. Funny- your blogs are never boring. I find them very enjoyable. Well, I know you have a bird post planned so that does have my heart rate elevated ha! Big thanks to Brad M. who noticed I had spelled Tamron wrong in the original post – corrected now although maybe the reason I was having so much problem with it is that it was really a Chinese knockoff ha! 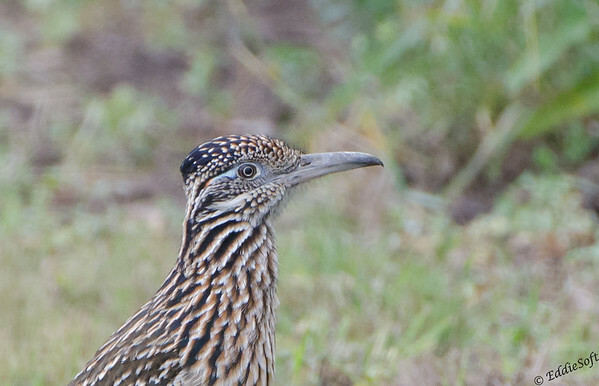 I think the person behind the last photo of the Greater Roadrunner on the Cornell site was having some fun by editing it to look like he was running like the cartoon. I don’t know what else it would be. Finally saw one of these at China Lake in California in March, but my pics are from far away. For some reason birds don’t just stop in front of me and pose like they do for you… Do you have any shots of it running? That would also be cool. Nice pics. I couldn’t tell from my shots how colorful these birds really are. I do have a few running … away from me. We were in Henderson when we first encountered one. Unfortunately, the fact that it blends in perfectly with the desert floor caused havoc on the sensors trying to pick out what to focus on – I guess if you consider soft a style I have one. You just need a UB that captures them and then flings them out in front of your camera. Oh, the UB has to shake them up a bit before launching them so they stand still for a few minutes trying to get their bearings while you snap away.